Remember when we were kids and around this time of year you'd sit down and write Christmas wish lists to Santa, Mom, Dad, Batman, and anyone else that might read and send presents? Well, since we've never really grown up we still do! 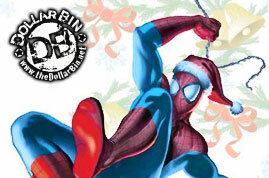 Take a break from shopping for our presents to hear what we'll be asking our favorite comic book publishers for this holiday season on this edition of the Dollar Bin. Episode 69: The Wisdom of Zima!